The Prati area is often overlooked by tourists, who just head to the Vatican and then leave, but I think it’s a great place to spend a bit more time – although I live there, so maybe I’m biased! 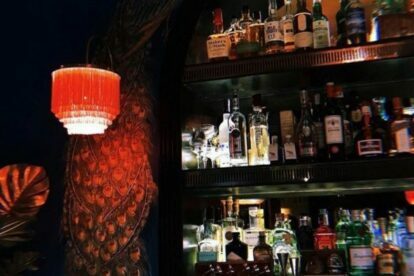 There’s loads of great bars and restaurants, and they’ve have just been joined by a new favourite: Emerald’s, a cocktail bar inspired by – and I quote – “the home of a fascinating South American Adventurer of the early 1900s who opened his home to eccentric visitors to show them merchandise and objects coming from distant lands”. It sounds a little eccentric, and it is. The décor alone is worth the trip especially if, like me, you like things a little OTT – there’s red fringed lampshades, marble drinks tables and velvet poufs decking out the room, with two massive peacocks flocking the well-stocked bar. Their gin-based cocktails are great, but order a gin and tonic at your own risk – they’re almost a whole glass of (delicious) gin topped off with a just spritz of tonic! Emerald’s is a perfect cosy bar for a pre-dinner drink or a nightcap – it’s a small spot though, so I’d recommend booking ahead if you don’t want to risk being relegated to the tiny standing area at the back.